NovaBACKUP Professional takes the worry out of data backup and recovery. Back up your entire hard drive or pick the files and folders you want to be able to recover. Simple and Easy backup Software for your PC laptop or workstation. 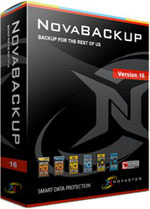 NovaBACKUP Professional is everything you need to easily protect your PC workstation or laptop. With award-winning PC backup software, consistent compatibility with the latest Windows OS, and streamlined disaster recovery that restores all of your data in the event of a crash, it's everything you need, with none of the hassle. With NovaBACKUP Professional, you can choose between file-level or image-level backups – meaning you can backup individual files, or your entire PC hard drive. Works on Windows 8.1, 8, 7 and XP. NovaBACKUP Professional tested 4x faster than the nearest competitor. And, you can use automatic scheduling to backup bit-level or incremental changes, in between your full backups – ensuring your data is always protected, without needing to continuously run full backups. With easy installation, simple step-by-step wizards, and automated backups, NovaBACKUP Professional makes it easy to backup your PC and keep your data protected. Get your first backup up-and-running within minutes. NovaBACKUP Professional includes 1 year of NovaCare Basic support. That means unlimited access to email and live chat help from our local, one-on-one support engineers, 30-day access to product updates, and unlimited access to a vast library of helpful guides and documentation. Always Microsoft-ready, with full Windows 8.1 support. NovaBACKUP is always Microsoft-ready, including support for the latest Windows 8.1 OS. It’s also backwards compatible, with support for all Windows operating systems going back to Windows XP.